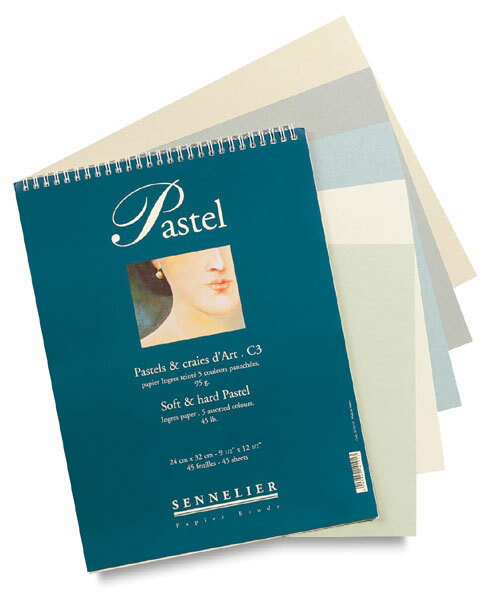 Sennelier's Pastel Spiral Pad contains five assorted colors — Light Cream, Dark Cream, Felt Blue, Light Gray, and Medium Gray. The paper is an acid-free, 45 lb Ingres paper with fiber inclusions. It is intended for hard or soft pastels, charcoal, and pencil. The pad contains 45 sheets, measuring 9½" × 12½" (24 cm × 32 cm). It is double-wire spiral bound on the short side.